Fuel scarcity bites harder in Lagos and its environs despite the assurances by the Nigerian National Petroleum Corporation (NNPC) of over 80 million litres daily supply to Lagos, Abuja and other major cities. 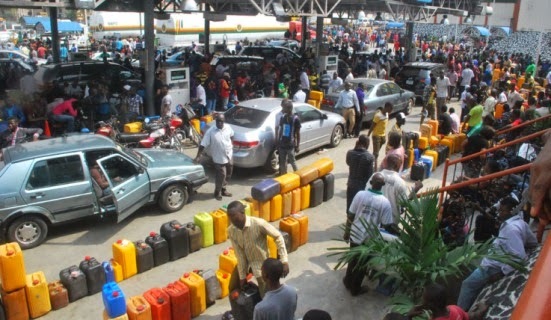 Most filling stations visited by the Nigerian Tribune on Thursday were shut due to non-availability of products while the few ones that were selling had long queues of vehicles waiting endlessly to get the product. One of the two NNPC Retail Stations situated on Kudirat Abiola Way, Oregun, was out of stock while the other was dispensing to motorists at N145 per litre. Mobil, Total and Conoil filling stations along the same route were also dispensing to motorists. The same thing with Mobil, Conoil, and Oando filling stations in Maryland; Mobil at Anthony wasn’t dispensing, MRS and NNPC Retail Stations at Palmgrove were also dispensing. Nipco, Forte, Conoil, and Total at Fadeyi were also dispensing. Yet, the stations were besieged with long queues of vehicles. However, the Group Managing Director of the Nigerian National Petroleum Corporation (NNPC), Dr. Maikanti Baru, has said that the corporation doubled the daily supply of Premium Motor Spirit (PMS), otherwise called petrol, from daily 700 trucks (about 27million – 30million) litres per day supply to 80million litres per day since the current hiccup in the supply chain was noticed a few days back. The GMD attributed the hiccups in the supply of PMS to rumours about the purported planned increase in the price of petrol. He stated that some marketers, in their quest to cash in on the situation, suddenly started hoarding products. “But we swiftly swung into action by doubling our supply nationwide. At the time the rumour started, we had about 30-day sufficiency. The normal daily supply to the nation is 700 trucks, equaling about 27-30m litres per day,” he said. He further informed Nigerians that the NNPC has enough products sufficiency that will last up to 30 days. Dr. Baru said that at least a billion litre petrol laden cargoes were heading to Nigeria shores at the end of December which he noted would return the Country to a 30-day-plus sufficiency.